On Sunday, I managed to ride almost two-hundred miles without ever leaving Los Angeles County — and without hitting too much traffic or too many lights. Despite the sprawling metropolis and seemingly endless commercial and residual structures, traffic and congestion, great roads for riding motorcycles are not as far as you’d guess. After breakfast in Tujunga with a friend of mine, I stopped back at my place in Pasadena to pick up my girl. 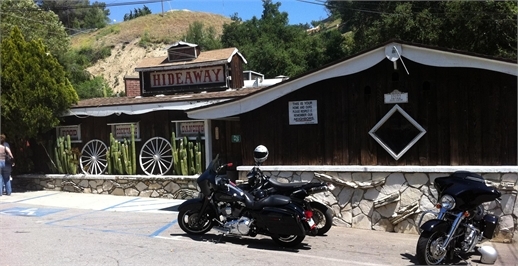 We fueled up, and decided we would scoot up through the Angeles Forrest to Newcomb’s Ranch — a little restaurant and bar that attracts almost exclusively motorcyclists, with the occasional Jeep or sports car driver. It’s one of those places that you go for the drive, not the destination, because it’s forty miles from anything else. Amazing, really. It’s still in Los Angeles County, and yet it’s forty miles from the nearest gas station, restaurant, convenience store, or watering hole. (Seemingly) unfortunately, we didn’t get too far, because one of the roads (the Angeles Forrest Highway, I think) was blocked off. We doubled back, to find a pack of motorcyclists contemplating other routes to get around the road block. After a few minutes’ debate and an invite to tag along, we followed this group of mostly Harley-Davidson riders for an hour or so. To my surprise (can I say “delight” without sounding ridiculous?) we landed at a cool little spot spot tucked away off Kagel Canyon Road in Sylmar. I had heard of the place plenty, but had never been there: The Hideaway. 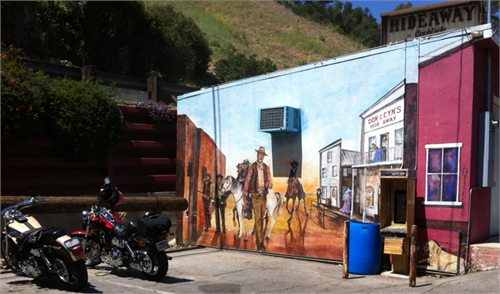 I parked my motorcycle next to a huge painting of John Wayne (in the horse-only spot) and headed in. The bartender welcomed us, and seemed to know it was my girl’s and my first time there. “Our moto is ‘Horses, Harleys, and you,” she told us. The “you,” she explained, is a catch-all for anyone who doesn’t have either. A tip: If you are gonna stop by, make sure to hit an ATM first, as the place is cash only. After hanging out with our new friends for an hour or so at the Hideaway, they decided to hit a party. My girl and I thought we would try our luck getting to Newcomb’s by a different route. After a few twists and turns, we took Big Tujunga Canyon Road, and found that it was wide open. We were well on our way to lunch until we hit another roadblock, this one due to a down biker. Details about that, and the rest of the ride, tomorrow.